I exhausted a ration of one of my maintenance medications this morning. Not a fold in the landscape however, since I am organized enough to make sure I exercise the refill renewal process adequately in advance. But what is marginally significant is the transition activity itself. First, I have to find the new ration and determine if the bottle the medications are in is suitable to the contents and where I place the bottle in the medicine cabinet. For some reason in the last year or so my pharmacy has begun to exercise what looks like poor judgment in selecting containers. Occasionally they put the ration in a bottle that is too small. This is a difficulty because it leads to spillage and if the pills end up on floor, possible wastage which is an acute rectal pain given insurance scheduling. For these it is usually simply a matter of transferring to a larger bottle and migrating the label. More commonly, they put the ration in a bottle that is too large, which necessitates transferring to a smaller bottle. And migrating the label, of course. Needless to say all this transferring and migrating irritates the medicalists who make this silly demand that I bring all of my medications to appointments rather than take a list. They seem amazed that anyone would ever change containers. I sometimes think they have veterinarian envy and wish for patients who cannot use language. But the major effort involved is when the bottle is appropriately sized and, as it invariable is, is capped with a ‘child proof’ top. Despite the fact that I loudly enunciate to the pharmacists that I neither need nor want these tops, they seem to take vicious delight in using them. So the next thing I have to do is get out one of the most important tools in my path to senility and discorporation, a small pair of flush cutters. These are wire cutters that look like the ordinary ones but only have edge on one side so that you can cut wires off flush. These are more normally found on a soldering workbench than in a medicine cabinet but because of the ‘child proof’ caps they are a necessity. I use them to nibble off the plastic tabs or flanges that engage the restraints on the cap. This process is relatively rapid in completion, about the same amount of time as needed to migrate a label from one bottle to another, but for smooth operation much more important. After all, one only consults the label once a week or so but removes the cap once or twice a day and the time, effort, and frustration saved are significant. But as FD SCP has been known to opine, ‘only a nerd would have flush cutters in his medicine cabinet’, usually just before she hands me one of her bottles to nibble into utility. Because the tabs on the bottles/caps – the design varies somewhat – are plastic, light weight flush cutters work quite well. Care needs be taken, despite the greater cost and difficulty of finding – I got mine at the local auction outlet in Guntersville, the millfoil capitol of Nawth Alibam, but given its nature stockage is stochastic – to avoid the more common diagonal cutters that are edged on both sides of the blades. These leave werf behind that may engage the locking mechanism. One of my acquaintances, who is rather too frugal for his own good, tried to make do with an Xacto knife. His partial finger amputation is healing nicely and the fervor of his vituperation has subsided since we presented him with a pair of flush cutters as a get well inducement. The feeds yesterday delivered a couple of weapons of mass nostalgia. So overcome with the emotion of memory, I failed to blog. This morning is a new week, at least according to the convention that Sundae ends the week, and courtesy of an hour of aerobic perspiring I have some of the irrationality under control. Two of these bouts seem worth boring with, just because of innate perversity. The first was prompted by a link to a video, on IO9, I believe, to the Tacoma Narrows Bridge. I forget how many classes I had to watch this film in. I know in freshman general physics – I think it was shown during the period when the professor’s wife was birthing – and in sophomore mechanics. The story was that this was an example of resonance forcing, a subject of some interest to students of physics since it is so hard to get to work. And perhaps because it got covered in a rather incomplete fashion. What didn’t get covered was the details of how the energy gets into the system and how it gets back out again, a matter that is still not well understood in terms of practical application. But what came back with seeing that film was all the memories of those wonderful days when life was simple, so long as the student deferment and the money held out, and all you really had to worry about was learning everything you could and keeping hormones under control. The latter was important because the campus of the Black Warrior was a frat shul and most coeds didn’t have any attention span for nerds, especially non-engineer nerds. Engineer nerds were sorta acceptable because they would make good salary and hence be good husband potential. Another component of this was wind. The wind that shook apart the bridge could do so impart because it kept blowing and have a broad range of frequency components. That allowed the resonance to be sustained as the bridge flexed and its resonance frequency shifted. And wind was pretty well missing that summer when I took freshman general physics. But that’s another tale for another blot. 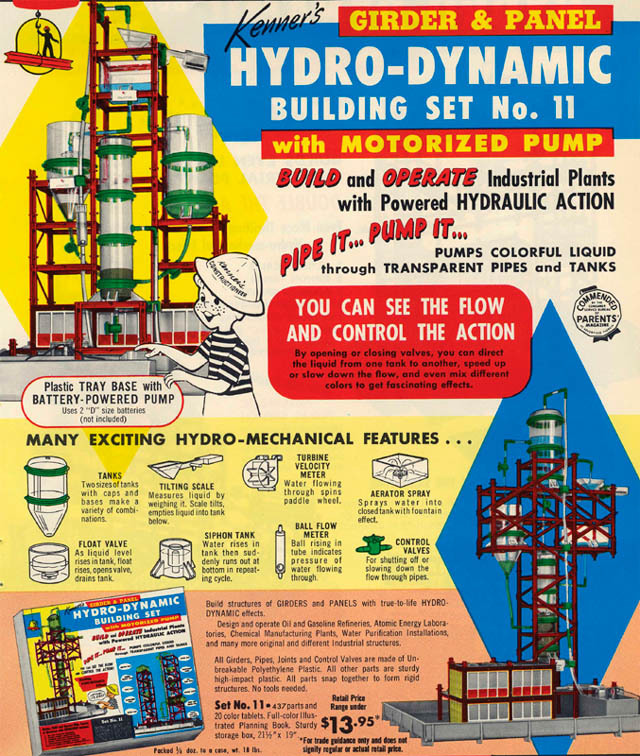 The second nostalgia came from an article on construction toys. [Link] No, not those Tonka toy vehicles that I managed to miss but my younger brother had hordes of. I wasn’t really the male version of mud pies type anyway. Rather, the archetype of the article was the Erector set. Yes, I had an Erector set as a child, and in retrospect it was my third most favorite building thing. I can well remember going to bed at night with the tips of my fingers aching from screwing together those minuscule nuts and bolts, small cuts on my hands from when the screwdriver slipped and catastrophe struck. And for some reason whatever got created had to be disassembled by bedtime. Sometimes a child’s life is a snapshot of Tartarus. But my second favorite building thing was a similar collection of parts that allowed me to do things with water. Given the prohibition on having any creation exist overnight, I am still mystified why my parents, my mother in particular, let me play with water. And water is amazingly attractive to children: solids are aplenty; gases cannot be seen; but water is just strange. I also recall that this kit had the advantage that it didn’t have nuts and bolts, just friction connections. So it was easier on the finger tips. But both laid foundation for that fascination with the bridge. And thereby, the man. Why is Facebook so depressingly banal? OK, the weekend has returned in vengeance. Actually, I suppose it sorta started yesterday as we gradually edge our way to a four day work week, but today for sure. That means articles to clean out and perhaps even find some theme for. The starting one, the basis of the name for the blot, is based on an article [Link] from National Geographic about research at Royal Holloway U. The rebound mini-cold phase usually referred to as the Younger Dryas is sometimes blamed on an impact by a wandering body – astronomical, that is, and contrary to language, not a planet but a meteorite or some such. Now there is evidence refuting this and it is based on analysis that indicates that what was previously thought of as bits of remnant of a CHON meteorite are actually bits of fungus spores and insect stercus. This is Victorian era science at its finest carried forth into our present day of corporate pseudo-science. Even Holmes himself might have been expected to have written a monograph on the subject. Hurrah for the study of bits! Next, we have news [Link] that the lads (and lassies) at the Large Hadron Collider have simulated the sound they expect of a Higgs boson. This may seem a bit strange; it did to me until I thought of the sounds of the particles I have known. The most common are the sounds of electrons – they make a crack sound. And I have heard a sizzle when I have seen Cerenkov radiation. I can only hope this is not an instance of imagining a noise of what turns out to be an imaginary particle. Next, boffins at U College London have determined a GUB (greatest upper bound) on the mass of neutrinos based on observational astronomy. [Link] They say the mass is no-greater-than 0.28 eV, which is of order of 1E-09 of the mass of a hydrogen atom, which, incidentally, is made up of two particles. I have to admit this is all rather exciting to physicists and to an ORF physicist  in particular. All of my career the particle wonks kept telling us that neutrinos didn’t seem to have any mass. Now they do and we go around, a bit like monks, chanting that neutrinos have mass. Rather reminds one of clerical bureaucrats after the bishop of Rome changes policy. And not to be outdone, the folks at U Arizona tell us that those reusable pseudo-cloth grocery bags we are all supposed to be toting instead of consuming Tellus with MalWart plastic bags (how about just not shopping at MalWart?) also have unsuspected mass. [Link] Seems that the bags harbor all sorts of microbes including E. coli. And yes, I do have to admit that I bought some of the bags although my concern had more to do with getting groceries home in my motor car than in combating the environmental depredations of corporate Amerika and its consumerist minions. Not that I am opposed to doing things to preserve the biosphere but it is discouraging when something like 0.6 of the households in Greater Metropolitan Arab do not recycle, (and are not hauled from their beds and shot in the neck to tumble into an unmarked mass grave,) and the recyclage is limited to what the contractor can make profit on, not what can be recycled. Besides, I have a second use for those bags to package my recyclage. As such they are useful all year round whereas newspapers have second use only in watermelon and mush melon (cantalope?) season. Should I get a parakeet to strengthen the newspaper industry? And lastly, I note an article on writing/running FORTH programs on FCs. [Link]  This recalls the days when I bought my first PC back in the days when one bought one from an IBM dealer with floppy disk drives and maybe 65 kB of RAM. I bought mine to learn how to program on PCs and one of the languages I played with was FORTH. Programming, at least back in the days of DOS 2.0 and integrated editor-compilers was a matter of write code, save code, compile code, run code; repeat. For FORTH programming one generally had to add the step after run code of ‘reboot computer’. Programming in FORTH was a bit like playing Russian Roulette with an machine pistol. There were no safeguards and so if one did something that whacked the OS one went off into computer la-la land. Nowadays, of course, we just lock the program up in its own virtual box and kill the box when we vertically copulate. But in those days reboot was one of our more common activities. FORTH was one of the reasons I looked for something else, and why I embraced Turbo Pascal. It did many thing right that were wrong with early PC programming: the integrated editor-compiler-debugger environment and a very robust language. Them MegaHard came along with Windows, which they stole from XEROX, like everyone else, and made programming nothing more than etch-a-sketch. Nowadays, I have the joy of Linux and terminal so I can really program when I need to. But I don’t think it will be in FORTH. No, ORF physicists do not have pointy ears. Many of us have hairy ears but that has to do with age. For those who have forgotten, an FC is a ‘Free Computer’, which is a PC that has been freed from MegaHard slavery by having Linux installed as an OS. Incidentally, ‘cack-handed’ is British for awkward or clumsy. This is why Bragg writes books that lots of people read and gives talks that lots of people listen to. He has a command of communication that not only captures meaning but also enraptures the reader/listener. A cynic might be tempted to label him a demagogue but I am not sure the purpose is all that sinister other than his personal and limited agenda. I, on the other hand, write with as much accuracy as I can muster but inspire few, if any. Sometimes nerds get the pieces right but fail the whole. Nonetheless, the piece above did focus my attention span on the notion of email. I dismiss texting and twiting  here because of their brevity. Such may be appropriate for infomongering, but not for more substantive conversation. Certainly they are the telegraphs of today, but email may be argued to be the letter of today with equal substance. But as Lord Bragg offers, keying an email, even with specious selection of font and ‘stationary’ is scant substitute for a good fountain pen with the right nib and ink, and good paper that caresses the nib and melds with the ink. There is something sensual about how information can be lain on paper that is absent from the preparation of email. I could, I suppose, use some gratuitous reproductive activity metaphor here but I shall not. Keying an email is limiting, like trying to don one’s clothes in a small closet. The end may be reached but one is dissatisfied, distressed, and despaired in doing so. Somehow the environment of information instantiation is limited in an email editor; it is not, or, at least, less so, with pen and ink. I should perhaps mention that pen and ink are not universally idyllic. Writing on a legal pad with a ball point pen is little better than keying email. To borrow a metaphor from Plato, keying email is his cave model, writing with pen and ink is to emerge into the open where we have dwelt as a species for millennia, writing with the right pen on the right paper with the right ink is the sky itself, a vista that overwhelms our senses and gives us seemingly unbounded scope for thought and expression. I do not want to do away with email. But I would like it to be a bit less constraining of my expression. Maybe then I could actually be expressive rather than just responsive? But I do entertain similar dreams of abolishing texting and twiting. Yes, I am aware that the popular usage is tweeting. A tweet is however, something uttered by a bird while a twit is a broken human. Sort for ‘information mongering’. And, no, I am aware that information is not one of the classical list of things that can be mongered. Clearly, however, gossip is a form of information, often the content of texts and twits, and it may be mongered. Also, fish may be mongered and like much of the information in texts and twits, smells shortly and foully. Yesterday was my day to journey to Huntsville, Nawth Alibam’s Shining City on the Hill, and it really was shining yesterday with all that insolation. But that put me behind in reading articles, so we have a bit of catch up this morning. First, we have news [Link] from researchers at U Arizona that friends on Facebook aren’t. Rather makes sense this would come from somewhere that friends are critical to survival, like a place where there isn’t much water. Not that it really surprises us. In fact, we suspect that a better term for those folks on Facebook would be neighbors rather than friends. Aside from the fact that you do get to affirm them, which we shall address later, they are really more like neighbors. After all, they do rather nasty things and you are stuck with them so you try to get along. And on the other thing, have you ever tried to unfriend someone? Makes nasty divorce look clean and easy. Or even turn down a friend request? That’s why I say they’re neighbors more than friends. Not that I dislike my neighbors, but I don’t want too much information, which is what Facebook is inherently. Yesterday, the TechRepublic folks sent me a link to an article “10 interview questions to help make the best geeky hire”, [Link] that piqued my attention. As previously, I could not resist responding to this quiz. 1: Star Wars or Star Trek? This is a hard one because there is so much ambiguity to what Star Trek means. Are we talking Janeway or Kirk? Anyway, regardless, the Star Trek theme is anti-slavery versus the Star Wars pro-slavery theme, so the decision is easy. 2: Who shot first, Han Solo or Greedo? This one is amusing. If you answered Star Trek to #1, then why know what the question refers to? 3: Movie or the original? This one is easy. All movie adaptations are corrupt and whacked. Only movies made from scripts not based on book, comic, whatever have any integrity. 4: What are 10 of “Weird Al” Yankovic’s greatest songs? Who? Not sure how someone, presumably a musician, that I don’t know can be responsible for classics? Besides, my taste runs to Kingston Trio and pipes. 5: Remember when Steve Jobs started KoalaSoft? 6: How will you bribe the gamesmaster? Depends on who the gamemaster is. They do have personalities, you know. After all, I used to GM modern armor games. 7: What were the original Intel Pentium CPUs most famous for? Buggy. Worse than Grace’s box. That’s why we had math co-processors. One of the ways to tell nerds from geeks in those days. 8: How would you describe the “real programmer”? The real programmer is the guy who doesn’t get paid to program. He gets paid to get stuff done that can sometimes be done with code. Code is a tool, not a self-definition. 9: Who is your favorite artist/musician? 10: Who was Gary Gygax? The shmendrick who did D&D. And plagued real wargamers with insecure bogs forever. I fail. I hope, that is. Never wanted to be a geek. Happy being a nerd. And having spent almost twenty years of my life interviewing and hiring folks, I am happy to say I did learn some things not to do from this.